"The environmentalism so prevalent and popular around the world today, even within the church, is one that goes far beyond the stewardship of creation to which God called man in the first chapter of Genesis. The worldview of this kind of environmentalism and its ramifications must be clearly understood by Christians so that we can protect ourselves and especially our children from the unbiblical brainwash that permeates our schools, media, popular culture, and yes, our churches. The best organization that I know of that devotes itself to upholding a biblical worldview on environmental issues is the Cornwall Alliance for the Stewardship of Creation. 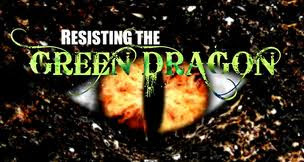 They have just produced a DVD series entitled “Resisting the Green Dragon” which is made up of twelve, 30-minute sessions covering all aspects of the environmental movement as well as the biblical framework for Christian stewardship of the earth. This would be an excellent study series for your family, Christian school, Bible study group, or church."